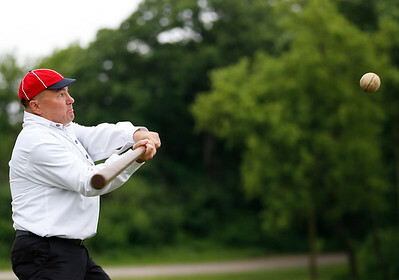 Paul Skowronski bats for the McHenry County Independants at a staged 1860 baseball game Sunday, June 10, 2018 in Prairie Grove. 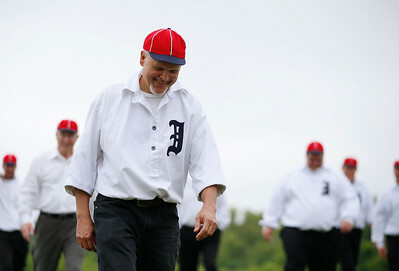 Kurt Begalka laughs while coming off the field with his team at an old-time baseball game Sunday, June 10, 2018 in Prairie Grove. 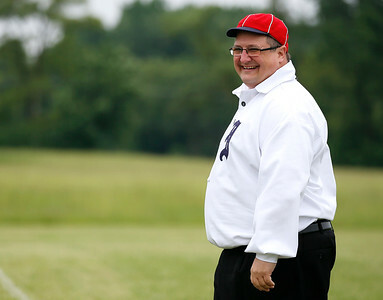 Tony Johnson smiles as he takes first base at a staged 1860 baseball game Sunday, June 10, 2018 in Prairie Grove. 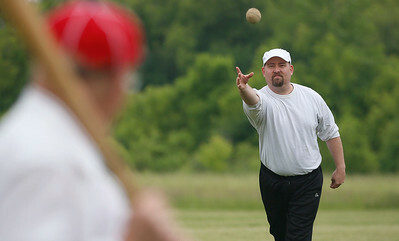 Chris Kubic of Zion pitches for the Grayslake Democrats at an old-time baseball game Sunday, June 10, 2018 in Prairie Grove. 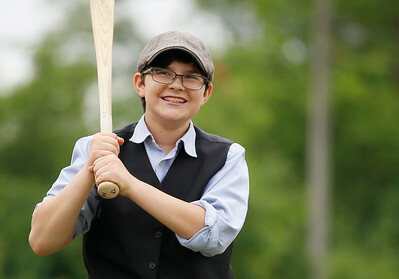 Carter Vincent, 13, of Grayslake bats for the Grayslake Democrats during an old-time baseball game Sunday, June 10, 2018 in Prairie Grove. 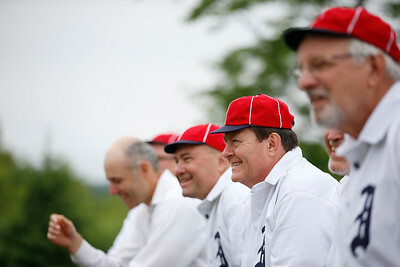 The McHenry County Independants cheer on teammates against the Grayslake Democrats during an old-time baseball game Sunday, June 10, 2018 in Prairie Grove. 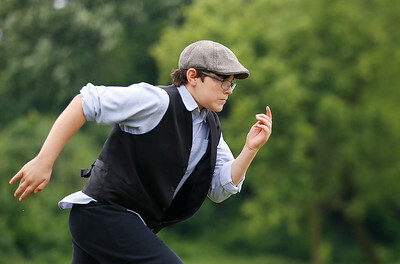 Carter Vincent, 13, of Grayslake runs to first for the Grayslake Democrats during an old-time baseball game Sunday, June 10, 2018 in Prairie Grove. Carter Vincent, 13, of Grayslake is out at first while playing for the Grayslake Democrats during an old-time baseball game Sunday, June 10, 2018 in Prairie Grove. 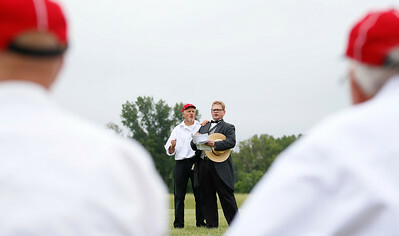 Kurt Begalka of the McHenry County Independants joins barrister Dave Oberg in a song between innings during an old-time baseball game Sunday, June 10, 2018 in Prairie Grove. Oberg is the executive director of the Grayslake Heritage Center and Begalka is the administrator of the McHenry County Historical Society. 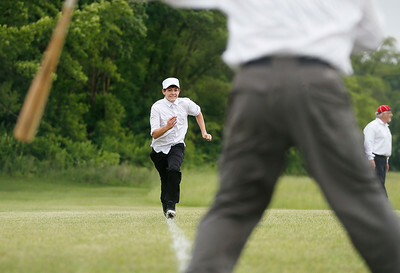 Cooper Vincent, 15, Grayslake, runs home during an old-time baseball game Sunday, June 10, 2018 in Prairie Grove. Starting lineups for the Grayslake Democrats and the McHenry County Independants take the field before the start of an old-time baseball game Sunday, June 10, 2018 in Prairie Grove. 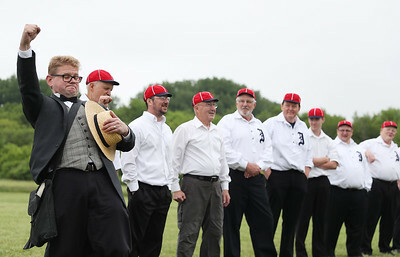 Barrister Dave Oberg announces the lineup for the McHenry County Independants at an old-time baseball game Sunday, June 10, 2018 in Prairie Grove. Haden Tipps, Walworth, Wis., beats Brian Roffle, Antioch, to home plate to determine running order before the start of an old-time baseball game Sunday, June 10, 2018 in Prairie Grove. 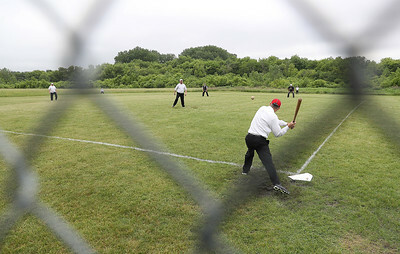 The McHenry County Independants bat against the Grayslake Democrats during an old-time baseball game Sunday, June 10, 2018 in Prairie Grove. 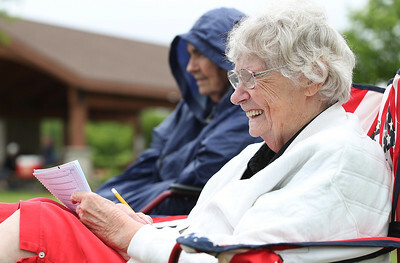 Mary Montgomery of Marengo smiles while keeping score at an old-time baseball game Sunday, June 10, 2018 in Prairie Grove. Montgomery is a volunteer with the McHenry County Historical Society.